Data logger, oscilloscope, signal generator and more! DrDAQ is a versatile instrument that connects to the USB port of any PC. Using the supplied PicoScope software it can be used as an oscilloscope, spectrum analyzer and signal generator. The trace shown in Figure A36.3 shows the result of a collision with a buffer packed with foam sponge. After the collision record the final voltmeter reading Vt and obtain a print-out on graph paper of the screen trace. Ensure that you note the details of both the voltage and time axes’ scales if they are not automatically printed. Repeat as required. Part 1: In general, for an impact to be least dangerous to passengers or damaging to the materials being transported, the force (voltage) - time trace for the collision should be as long (in time) and as small in amplitude as possible. Compare the traces for different buffer designs to see who has the best energy absorbing structure. Part 2: Use the two voltmeter readings Vo and Vt, the distance travelled by the wagon whilst the capacitor was discharging, and the value RC of the resistor-capacitor combination in the timing circuit, to calculate how long the discharge lasted, and so the time of travel of the wagon whilst this occurred. Noting that the collision with the sensor occurs after this time, calculate the velocity with which the wagon hit the buffer and its momentum. (Assume uniform acceleration down the slope.) See Additional Sheet section 2 if you need help with this. Use the Voltage - time trace, the value of the force which produces a voltage output of 100 mV, and the value of the wagon’s momentum before the collision with the buffer, to calculate the velocity with which it bounces back off the buffer. See Additional Notes if you need help with this. So a force of 0.98 N produces a voltage output of Vload - Vno load = 21 mV. Therefore 0.98 X (100/21) N , or 4.67 N, produces a voltage output of 100 mV. So the velocity on collision with the buffer is given by v = u + at where v = 0 + 1.52 m·s-2 x 1.02 s = 1.55 m·s-1. Therefore the momentum of the wagon on collision was 0.187 kg x 1.55 m·s-1 or 0.290 kg m·s-1. The impulse, and so the total change of momentum that took place, is shown by the area under the Voltage (force) - time trace above the baseline voltage. Calculate this first in terms of the number of small squares occupied. On that shown by area A in Figure 36.3 (figure above) the number of squares was 459. Now to calculate how large an impulse or change of momentum each square represents. Count the number of squares on the graph paper in the area marked B (150 to 250 mV) x (-20 to 0 ms). In Figure 36.4 it is 145. 100 mV represented a force of 4.67 N, so this number of squares represents an impulse or change of momentum of (4.67 N x 20 ms) or 0.0930 Ns or 0.0930 kg m·s-1. So each square represents 0.0930 kg m·s-1/145 or 0.000641 kg·m·s-1 and the area of the trace (0.000641 kg ms-1 459) or 0.294 kg ms-1. Now to calculate how large an impulse or change of momentum each square represents. Count the number of squares on the graph paper in the area marked B (150 to 250 mV) X (-20 to 0 ms). In Figure 36.4 it is 145. 100 mV represented a force of 4.67 N, so this number of squares represents an impulse or change of momentum of (4.67 N x 20 ms) or 0.0930 N·s or 0.0930 kg·ms-1. So each square represents 0.0930 kg·ms-1/145 or 0.000641 kg·m·s-1 and the area of the trace (0.000641 kg·m·s-1 459) or 0.294 kg·m·s-1. The change of momentum indicated by the area of the trace will be equal to the sum of the momentum of the wagon as it collides with the buffer and of the wagon as it bounces back off the buffer. The wagon’s momentum as it collided with the buffer was 0.290 kg·m·s-1, so its momentum on bouncing off must have been (0.294 - 0.290) kg·m·s-1 or 0.004 kg·m·s-1. With the wagon having a mass of 0.187 kg this gives a bouncing back velocity of 0.004 kg·m·s-1/0.187 kg = 0.021 m·s-1. This final activity of the A2 unit Transport on Track brings into play a number of facets of physics dealt with in the unit: knowledge of (i) how the time-constant RC affects a rate of discharge of a capacitor and the voltage across it, (ii) how to calculate (with uniform acceleration) acceleration and velocity when a time and distance of travel are known and (iii) how to calculate the momentum change from the area under a Force-time graph. The activity has been split into two parts. Initially the students select the material which they feel will provide the safest bumper to bring the wagon to rest. Print-outs obtained of the Voltage (force) - time graphs can be compared and that with the lowest voltage (force) for the longest time would be the winner. Vt = Vo.e-t/RC, and using equations of motion. Using Pico DrDAQ or ADC-40/42 with PicoScope software, useful results were obtained with the timebase set at 20 ms/div; the trigger at single, trigger level rising and at about 20 mV*; the X-gain at 1; the Y-gain at 20; and the % advance at -10%. With the trigger setting on ‘single’ the trace obtained remains on screen. Traces can be saved then or, with ‘autosave’, saved automatically. The force sensor is a piezo-resistive device and is linear in response up to near 15 N. Any off-centre collision with the plunger has minimal effect, although it is best to arrange for the buffer box to be positioned as centrally as possible. * You may be able to lower this value but it must be high enough to prevent triggering too early. Voltmeter 0 - 10 V f.s.d. *For DrDAQ connection is made via V and Gnd and it is recommended that you screw a red lead terminated by a 4 mm plug into V and a black lead terminated by a 4 mm plug into Gnd. **For ADC-40/42 connection is made via the BNC plug to 4 mm plugs lead. The contact surface between the wagon’s wheels and the track will need to be cleaned with emery cloth before use. It is also wise to clean the axle rods where the grub screws of the wheels make contact. The aluminium corner is anodized and so has a non conductive coating all along it. This needs to be removed where indicated on Figure T36.2 and at the points where the nut, bolt and solder are attached. Use emery cloth to remove the coating. Place PVC tape over the aluminium where it is to remain insulated. Screw the plastic downpipe firmly to the brick using the screws and Plastiplugs. Bolt the force sensor in its clip centrally (vertically and horizontally) to the flat front surface of the downpipe. Do, however, ensure that a hole is made in the downpipe to allow venting of the force sensor - note a vent hole in its base. Mount the two 4 mm sockets on the top surface of the downpipe. Detach four terminal pins from the PCB terminal strip. Solder the battery clip to two of these. Solder wires to a further two terminal pins and then connect these to the red and black sockets on the downpipe respectively. Now push the PCB terminal strip pins into the socket housing so that, when it is pushed onto the force sensor the connections match with those shown in Figure T36.3. *The capacitor must be low leakage. Adjust the value of the 2.2 kΩ pre-set resistor so that its combination with the 10000 mF capacitor gives a time-constant RC of 10.0 s. This is most easily achieved by connecting the RC timing unit up as shown in Figure T36.5. Put the switch to ON to charge up the capacitor and note the reading on the voltmeter. Put the switch to OFF. Now place a shorting lead between the two white sockets, time for 10.0 s, and remove the shorting lead. The reading on the voltmeter now needs to be 0.37 (1/e) of what it was initially. Repeat, adjusting the preset resistor until this is the case. If the voltage at the end of the time is too high, reduce the preset's resistance and vice versa. NOTE: For near perfection one should include the wagon and the track’s contact resistance in this circuit when adjusting the RC timer unit to give a value of RC at 10.0 s. In reality their resistances are low, a few tens of ohms, and indeed do vary over the course of the run. Hence it is suggested that this refinement is ignored. The kit (2408B) is of obvious quality, easy to setup and calibrate and the free to download software has a reasonable learning curve. Superb kit, superb support, what more can I say. I have been using my 4224 PicoScope for years. I travel abroad so this has been ideal due to its physical size. Storage of waveforms on my Laptop is very easy allowing me to quickly email waveforms to my Colleagues. Not many USB scopes works on Win & Mac & Linux too, so that proves me that guys from Pico really cares about us, customers. This made my decision much easier when I was looking to buy an USB scope. We have been using Picoscope 6404D for quite some time, and are amazed by its accuracy and powerful emulations while working with numerous signal evaluations. 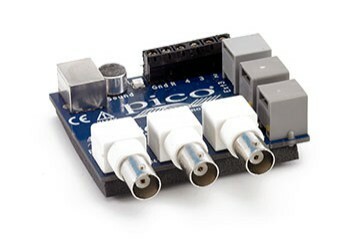 PicoLog TC-08: This is a very nice unit that works consistently and reliably. It is a great scope. I had a weird problem - it did not work on one of my PC’s. Customer service gave me first class service. If I could give 6 stars for customer service - I would do so. Perfect Partner for Development of Encoder controlled Stepper Motor Actuators. Since the included software is really stable, this type of device is a great tool for great tasks! So simple to use & beats any other I have ever used hands down. Great functionality in a compact size. I really like moving the mouse pointer to a position and having the Time and Voltage display the values at that point. Calibration equipment is a breeze with that feature.